What is the point of eating good food and taking super supplements if they're not going in?! Many people don't realise that their bloating, fatigue, skin issues, allergies etc are at least partly down to a lack of stomach acid and/or enzymes: malabsorption, in short. And, if you think this isn't you because your symptoms are from high acid, you may need to think again. The vast majority of people with so-called high acidity issues like reflux or heartburn have the problem because of too little production of stomach acid: the body never switches off production as it should because levels never actually get to a high enough point after eating to trigger the off switch! Ooh, controversial. But true! Have a read of the factsheets above for more on this. 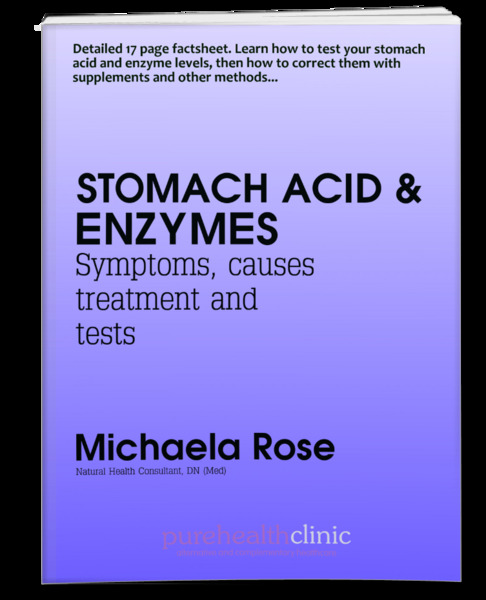 This factsheet gives you chapter and verse about how to ensure enough stomach acid and enzymes to digest and absorb properly. We are not what we eat; we are actually what we can absorb, and you would be surprised how many need a little extra support. Even stress can lower zinc, which is needed for stomach acid production and levels start to drop. It happens much more rapidly too after about age 40. In this 20 page factsheet, you will find tons of ideas on how to check your levels, specific protocols to follow, non-supplement ways to encourage production and much more...simple when you know how, and can make SUCH a difference.